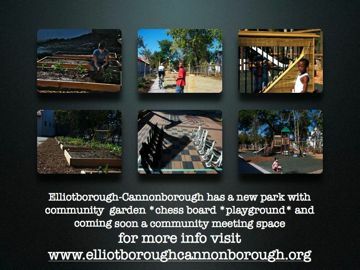 Thanks to the efforts of the cannonborough/elliotborough neighborhood association and the city of charleston, a derelict building located on line street at the end of rose lane, has been converted from an abandoned city garage to a fantastic neighborhood park. Garden plots are available to those who sign up for them and the city even provided the plants. The plots are available as a use it or loose it program to make sure that the garden actually is maintained by the residents and there is also a nice playground. The building is in the process of being discussed and might be renovated into a community meeting space.